Reality? Truth so far unclarified concepts. What is the reality everyone is talking about? We have more than 7 billion realities and everyone lives a slightly different. You can not even be sure that you live your „own“ because we are all constantly affected by the flow of information from others, subliminal messages in radio, TV, newspaper that you want to persuade certain things to family evenings that are energetically more connected with you. The main problem, however, is that many do not even dare to think otherwise. 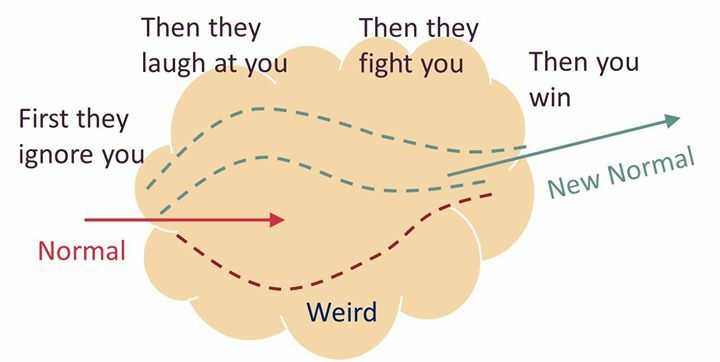 There have been some scientific experiments on how group thinking causes individuals to go along even though they initially did not think so. What is thus perceived by several persons as perceptible also determines the perceptual possibilities of the individual. We are a walking radio that receives and depending on the frequency setting you get this or that through, but it has nothing to do with you. But you are simply a perceiving being who picks up and passes on the collected frequencies of a collective consciousness. 99% of the thoughts and feelings you perceive are not yours. An Eskimo can differentiate 20 kinds of fresh snow or recently I was told that also green oranges and bananas are very delicious (in India) which was strange, because in Europe we are with the idea that they were immature, there are even red, purble bananas etc. We orient ourselves in our world around a common sense. Even when I was in India for 2 months, it was still funny for me to see red bananas and accept them as edible. People who have never been to Australia or Uranus believe it exists because we agreed. Believing is only a permissible thought pattern, because our system is 99% twisted on against, we do not believe some things because it has not yet reached mass consciousness such as free energy (known since Einstein and Tesla, everything is energy and therefore can also tapped, since 6 years Keshe free energy generators, self-sustaining electric circuit by magnet motor already 1972 ect. ), telepathy (thought transfer), telekinesis (matter move by thought force), pyrokinesis (fire by thought force), levitating (hovering, flying), Clairvoyance ect. , There are so many inventions today for the energy conversion of plant energy that is used for street lighting, earth-air-light energy, machines that convert plastic waste into oil, etc. we just have to separate ourselves from the slave system and go into the responsibility. Why is that, although there are some scientific records for it. In my opinion, it is the fear and the people who are still in power. Because it is easier to control fearful people, which is why we also have more and more laws that only serve to control the people and the people is being fooled. But what are they protecting us from? The criminals are the ones who make these laws and do not keep themselves off. Make people intelligent and bring them values ​​and charity, then we do not need that and evolution can take the next big step. Criminality prevails, since we are educated in a greed / stinging society and still need money and argue for possessions, we would abolish this and realize that we all had it all we would long ago world peace and no more poverty. Anything that we do not understand or are too hard to explain scares people and they therefore prefer to do an old mass lie instead of investigating, because it is also the more comfortable way and it is easier to join the crowd to stay in its comfort zone. When you look behind the fear, you realize that everything is an illusion. For example, someone is afraid of dogs, so how do you solve the problem if you are not confronted with it? Once you understand how a dog works / react, you do not need to be afraid of it anymore and that’s the way it is. Think about racism, which is not that long ago and continues to be felt. Example: The children’s game: „Who is afraid of the black man“, it was literally burned into the people that dark-skinned people are evil, to be white is the noble class, now the youth runs into the solarium and to get darker. There is no magic and no tricks if you understand the technique / information, there is not much that can surprise you. We are just a few things more habitual than others, which is why we can accept things that we are not used to more difficult. We experience something and then sort it into a certain position in our model of the world and the more often we then construct that experience, the more immutable it becomes. For example, the first time you see an alien, your head will initially refuse to accept it and tell you it’s a hallucination, then you’ll see it more often. This pattern prevents us from experiencing or rethinking information. Nothing is as it seems. The only constant in the universe is change. There is no valid causal causal explanation for any human cognition so far. We observe environments, but what we observe is thought of by ourselves, and it is still not clear whether there is anything outside of us. The environments we normally perceive are communication, the nervous system and the physical environment. What we do not normally perceive is other psyches yet we imply a psyche to people even to those we only hear on TV. So it is possible that one can generate information in other psyches. In a hypnosis experiment a father who came with his daughter on stage that she is not here .So as she stood in front of him he was told to read the hypnotists watch who was behind the girl and he still could not see her and the hypnotist stood behind the child and he saw through the child through which the hypnotist held a watch in his hand and he could even read out the initials. In India there are even on the street shows where the whole group is hypnotized and all the same see only on the camera you can see something else. We shape our environment based on our expectations. Expectations, however, are imaginary concepts and how they do not occur, we are disappointed, that is, the own deception is revealed and you look behind the built-up illusion. so what makes us different from humans in the past? Although we have more information, we still have the same fear of accepting new things until it believes in the totality and therefore attacks / attacks everything we do not want to „understand“. After not a single change in intuition and explanation of the world could say so far: „this is the ultimate knowledge and that’s how the world works“. Final justifications determine themselves not to be questionable any further and this is exactly how they hinder their progress. Every human cognition is therefore always observation-dependent, and each new explanatory model merely enhances the ability to more consistently describe our observations, and not necessarily more correctly because it is a permanent path. Our school and unistandart knowledge therefore depends on the possible standard usually between 50-100 years. Above all, unfortunately, our school system does not encourage and stimulate self-learning but memorizing unreasonable data. To give uniform nonsense on demand for a short time, to produce a functioning not free-thinking broad mass. Our thoughts tend to be repetitive, mainly bringing the past or fears of the future. So how should you create something new when the mind is constantly burdened with something like that. Thought hygiene, meditation and other relaxation techniques help cleanse the mind and create a more beautiful reality. We are born into a world where we need our parents to satisfy our need for pampering, but little by little we should learn that this does not always go on and we begin to compensate for this with recognition and only get verbal pats when we get their standard satisfy. However, this need motivates us to hide because our wishes are often rejected and begin with a self-presentation that is mostly a self-lie. We act as if we knew this and that or as if we were one way or the other and in order to be able to maintain this, we have to present ourselves to ourselves again and again and, because of self-deception, we no longer really know who we really are. Since the unconditional love usually ends after 3 years, because the parents educate us in the way how we need to function. As the word implies, we are drawn in a direction that we would not inherently go, so much is being pulled away from our true potential. With our senses, we may just get a thousandth of what else is to be discovered. Our perception is just about 5% of color and other spectra, and people talk about realism just because they want to stick to an opinion. In my view, live we are primarily in two realities at the same time, with the one we are very familiar it is our everyday reality in which what happens we expect and there is another in the unimaginable happens as in dreams. These unimaginable phenomena then relate to the quantum world which overrides our learned Newtonian models. Quantum physics begins with molecules at 0.025 millimeters, which also describes the size of our brain synapses and our erratic and predictable thoughts. Thus, we are constantly in the exchange of these two worlds and our logic tries to incorporate the experiences in models. That is, you would perceive something often because it is stored (expected), although it may just happen quite differently. Your view first makes your reality, but this viewpoint is never fixated on you since the only constant change is and otherwise no development would be possible, however, your ego always thinks you are right now as you did a few years ago although you are safe in In the last few years, you have learned something new and see things differently. If you want to develop, always be prepared to question yourself and your model of the world again and again. Believe in your dreams and realize them, because just because someone else can not imagine, it does not mean that you can not do it, but only that he does not believe it (making mistakes) and throws his doubt on you. Wirklichkeit?Wahrheit bislang ungeklärte Konzepte. Was ist nun die Realität von die jeder spricht? Wir haben mehr als 7 Milliarden Realitäten und jeder lebt eine leicht abgewandelte. Du kannst dir nicht mal sicher sein das du deine „eigene“ lebst da wir alle durchgehend von Informationsfluss anderer beeinträchtigt sind, unterschwellige Botschaften in Radio, TV, Zeitung die dir gewisse Sachen einreden wollen bis zu Familienangehöre die mit dir energetisch noch stärker verbunden sind. Das Hauptproblem ist jedoch, dass sich viele auch gar nicht trauen anders zu denken. Es gab einige wissenschaftliche Versuche wie Gruppendenken den Einzelnen veranlasst mitzuziehen obwohl er zuerst nicht der Meinung war. Was also von mehrere Personen als wahrnehmbar angesehen wird bestimmt auch die Wahrnehmungsmöglichkeiten des Einzelnen mit. Wir sind ein wandelndes Radio was empfängt und je nach Frequenzeinstellung bekommst du dies oder jenes durch, jedoch hat nichts mit dir zu tun. Sondern du bist einfach ein wahrnehmendes Wesen, der die gesammelten Frequenzen eines kollektiven Bewussteins aufnimmt und weiterleitet. 99% der Gedanken und Gefühle die du wahrnimmst sind nicht deine. Ein Eskimo kann 20 Sorten Neuschnee unterscheiden oder kürzlich durfte ich erfahren das auch grüne Orangen und Bananen sehr köstlich sind (in Indien) was merkwürdig war da wir in Europa mit der Vorstellung einhergehen das sie unreif wären, es gibt dortsogar rote,viollete Bananen usw. wir orientieren uns in unserer Welt also um einen common sense. Selbst als ich schon 2 Monate in Indien war,war es immer noch komisch für mich rote Bananen zu sehen und sie als geniessbar anzunehmen. Leute die niemals in Australien oder am Uranus waren glauben dennoch das es existiert da wir uns darauf geeinigt haben. Glauben ist nur eine erlaubtes Gedankenmuster, aufgrund da unser system 99% auf gegen gedrillt ist glauben wir doch einige Dinge nicht weil es noch nicht das Massenbewusstsein erreicht hat wie zum Bsp. Freie Energie(seit Einstein und Tesla bekannt,alles ist Energie und kann daher auch angezapft werden, seit 3 jahren Keshe freie energie generatoren, selbsterhaltender Stromkreislauf durch Magnet Motor schon 1972 ect. ), Telepathie(Gedankenübertragung), Telekinese(Materie bewegen durch Gedankenkraft), Pyrokinese(Feuer durch Gedankenkraft), Levitieren(Schweben, Fliegen), Hellsichtigkeit ect. . Es gibt heutzutage schon soviel Erfindungen zur Energieumwandlung von Pflanzenenergie die für Strassenbeleuchtung eingesetzt wird , Erd-luft-licht-energie, Maschinen die Plastikmüll in Öl umwandeln usw. wir müssen uns nur vom Sklavensystem trennen und in die Eigenverantwortung gehen. Woran liegt das obwohl es einige wissenschaftliche Aufzeichnungen dafür gibt. Meiner Ansicht nach liegt es an der Angst und an den Leuten die nach wie vor an der Macht sind. Da es leichter ist ängstliche Leute zu kontrollieren, weshalb wir auch immer mehr Gesetze haben die nur zur Kontrolle der Personen dienen und den Leuten Schutz vorgegaukelt wird. Jedoch vor was schützen sie uns? Die Kriminellen sind die die diese Gesetze machen und sich selbst nicht dran halten. Macht die Menschen intelligent und bringt ihnen Werte und Nächstenliebe bei dann brauchen wir das alles nicht und evolution kann den nächstgrößeren Schritt machen. Kriminalität herrscht, da wir in einer Gier/Geizgeselltschaft erzogen werden und immer noch Geld brauchen und um Besitztümer streiten, würden wir das abschaffen und erkennen das es uns allen alles gehört hätten wir längst Weltfrieden und keine Armut mehr. Alles was wir nicht verstehen oder zu schwer erklärbar ist macht den Leuten Angst und sie glauben daher lieber eine alte Massenlüge anstatt nachzuforschen, weil es auch der bequemere Weg ist und es leichter ist der Masse anzuschließen um in seiner Komfortzone zu bleiben. Wenn man hinter die Angst sieht/geht erkennt man das alles eine Illusion ist. Jemand hat beispielsweise Angst vor Hunden also wie soll man das Problem lösen wenn man sich damit nicht konfrontiert?Sobald man versteht wie ein Hund funktioniert/reagiert braucht man auch keine Angst mehr davor zu haben und so ist es bei allen Dingen. Überlegt euch mal Rassismus was nicht mal so lange her ist und nach wie vor nachwirkt. Bsp. :Das Kinderspiel: „Wer hat Angst vorm schwarzen Mann“, es wurde regelrecht den Menschen eingebrannt das dunkelhäutige Menschen böse sind, weiß sein ist die edle Klasse, inzwischen läuft die Jugend ins Solarium und braun zu sein. Es gibt keine Magie und keine Tricks wenn man die Technik/Information versteht gibt es nicht mehr viel was einen noch überraschen kann. Wir sind eben nur einige Sachen gewohnter als andere weshalb wir Sachen die wir nicht gewohnt sind schwieriger annehmen können. Wir erleben etwas und sortieren es dann an einer bestimmten Position in unser Modell der Welt ein und je öfter wir dann diese Erfahrung konstruieren desto unabänderlicher wird sie dann. Beispielsweise seht ihr das erste mal einen Alien und euer Kopf wird sich anfangs strickt dagegen weigern dies anzunehmen und dir einreden wollen, das es eine Halluzination ist bist du ihn dann öfter siehst. Hierbei hindert uns dieses Muster, Informationen neu zu erfahren oder umzudenken. Nichts ist so wie es scheint. Das einzige konstante im Universum ist Veränderung. Es gibt bisher für keine menschliche Erkenntnis eine haltbare ursachenkausale Erklärung. Wir beobachten Umwelten, doch das was wir beobachten, wird von uns selbst gedacht und es kann bis heute nicht klar gesagt werden ob überhaupt irgendetwas außerhalb von uns ist. Die Umwelten die wir normalerweise wahrnehmen sind Kommunikation, Nervensystem und physikalische Umwelt. Was wir normalerweise nicht wahrnehmen sind anderen Psychen dennoch unterstellen wir den Menschen gegenüber sogar denen die wir nur im fernsehen hören eine Psyche. So ist es also möglich das man in andere Psychen Informationen erzeugen kann.Bei einem Hypnoseexperiment wurde von dem Vater der auf der buehne war die Tochter hoch geholt und ihm einsuggeriert das er seine Tochter nicht sehen kann.Als sie vor im stand und er die Augen öffnete konnte er sie noch immer nicht sehen und der Hypnotiseur stellte sich hinter das Kind und er sah durch das Kind durch das der Hypnotiseur eine Uhr in der Hand hielt und er sogar die Initialen vorlesen konnte. In Indien gibts sogar auf der Strassenshows wo die ganze Gruppe hypnotisiert wird und alle das gleiche sehn nur auf der Kamera sieht man dann ganz was anderes. Wir formen unsere Umwelt aufgrund unserer Erwartungen. Erwartungen sind jedoch gedachte Konzepte und wie die nicht eintreten sind wir ent-täuscht, das heißt die eigene Täuschung wird enttarnt und man blickt hinter die aufgebaute Illusion. Raum und Zeit sind Konstrukte die wir zur Orientierung verwenden obwohl wir in der Quantenphysik das schon vor mehr als 100 Jahren widerlegt haben. Menschliche Erkenntnis war jedoch schon immer grenzüberschreitend es nicht mal so lange her das die Menschen dachten die Sonne kreise um die Erde oder die Erde sei eine Scheibe(manche glauben jetzt wieder das sie eine Scheibe ist) also was unterscheidet uns von den Menschen früher? Wir haben zwar mehr Information jedoch immer noch die gleiche Angst, Neues anzunehmen bis es die Gesamtheit glaubt und greifen/attackieren daher alles an was wir nicht verstehen „wollen“. Nach keiner einzigen Veränderung der Anschauung und Erklärung von der Welt konnte man bisher sagen:“das ist die ultimative Erkenntnis und so funktioniert die Welt“. Letztbegründungen legen sich selbst fest, nicht weiter hinterfragbar zu sein und genau auf diese Art behindern sie ein weiterkommen. Jede menschliche Erkenntnis ist also immer Beobachtungsabhängig und jedes neues Erklärungsmodell verbessert lediglich die Möglichkeiten unsere Beobachtungen konsistenter zu Beschreiben und nicht unbedingt richtiger da es ein ständiger Weg ist. Unser Schul und Unistandartwissen hängt also dem möglichen Standard meist zwischen 50-100 Jahre hinterher. Vorallem bildet und regt unser Schulsystem leider nicht zum selbst denken sondern unsinnige Daten auswendig zu lernen an. Um einheitlichen Blödsinn kurzzeitig auf Abruf wieder zugeben, zur Produktion einen funktionierenden nicht frei denkenden breiten Masse. Unsere Gedanken tendieren zur Wiederholung die hauptsächlich die Vergangenheit oder Zukunftsängste bringen. Wie soll man also was Neues erschaffen wenn der Geist durchgehend mit sowas belastet wird. Gedankenhygiene, Meditation und andere Entspannungstechniken helfen den Geist zu reinigen und somit eine schönere Realität zu kreieren. Hineingeboren werden wir in eine Welt, wo wir unsere Eltern brauchen die unsere Bedürfnis nach Streicheleinheiten befriedigen, doch nach und nach sollen wir lernen das das nicht immer so weitergeht und wir beginnen dies durch Anerkennung zu kompensieren und bekommen nur noch verbale Streicheleinheiten wenn wir deren Standart gerecht werden. Dieses Bedürfnis motiviert uns aber dazu uns zu verstecken da unsere Wünsche oft abgelehnt werden und beginnen mit einer Selbstdarstellung die meist eine Selbstlüge ist. Wir tun so als wüssten wir dieses und jenes oder als seien wir so oder so und um das aufrechterhalten zu können, müssen wir uns selbst immer wieder so darstellen und wissen vor lauter Selbstbetrug gar nicht mehr wer wir wirklich sind. Da die bedingungslose Liebe meist schon nach 3 Jahren aufhört, weil die Eltern uns erziehen. Wie das Wort schon sagt werden wir in eine Richtung gezogen die wir von Natur aus gar nicht gehen würden, somit wird viel von unserem wahren Potential wegerzogen. Wir bekommen mit unseren Sinnen vielleicht gerade mal ein Tausendstel mit von dem was es noch zu entdecken gibt unsere Wahrnehmung nimmt gerade mal von Farb und anderen Spektren 5% war und Leute reden von Realismus nur weil sie an einer Meinung festhalten wollen.Meiner Ansicht nach leben wir primär in 2 Realitäten gleichzeitig, mit der einen sind wir sehr vertraut es ist unsere Alltagsrealität in der das geschieht was wir erwarten und es gibt genau so eine andere in der unvorstellbares passiert wie beispielsweise in Träumen. Dies unvorstellbaren Phänomene beziehen sich dann auf die Quantenwelt die unsere gelernten newtonischen Modelle außer Kraft setzt. Die Quantenphysik beginnt bei Moleküle bei 0,025 Millimeter was auch die Größe unserer Hirnsynapsen beschreibt und unsere sprunghaften und berechenbaren Gedanken. Somit sind wir durchgehend im Austausch dieser beiden Welten und unsere Logik versucht die Erlebnisse in Modelle einzubringen.Das heißt du würdest etwas oft anders wahrnehmen weil es so abgespeichert (erwartet wird) ist, obwohl es vielleicht ganz anders gerade passiert. Deine Ansicht macht erst deine Realität, jedoch ist dieser Standpunkt den du vertritts nie fixiert da ja das einzig konstante die Veränderung ist und sonst auch keine entwicklung möglich wäre, jedoch glaubt dein Ego immer recht zu haben, jetzt wie vor einigen Jahren obwohl du sicher in den letzten Jahren dazugelernt hast und gewisse Dinge anders siehst.Wenn du dich also entwickeln möchtest, sei immer bereit dich selbst und dein Modell der Welt immer wieder in Frage zu stellen. Glaub an deine Träume und verwirkliche sie, denn nur weil es sich jemand anders nicht vorstellen kann, heißt es noch lange nicht das du es nicht kannst, sondern nur das er es sich nicht zutraut (Fehler zu machen) und seinen Zweifel auf dich wirft. Wir alle sind mit den gleichen Rechten auf die Welt gekommen. Wer gibt einen König oder Staat das Recht über mich zu bestimmten? Habe keinen diesbezüglicher Vertrag zugestimmt! Jeder Mensch hat seine Aufgabe auf der Welt zu erfüllen, ohne dieser auch nicht glücklich und zufrieden ist.